Despite all ride-hailing drivers needing a public service vehicle (PSV) licence by July 12 in order to continue business, it seems response to obtaining the necessary requirements is still soft, at least where vehicle inspection is concerned. Up to April 10, only 35 of the estimated 200,000-odd ride-hailing vehicles in the country have undergone Puspakom inspection, Bernama reports. Part of the requirement for obtaining a PSV licence includes mandatory Puspakom inspection for cars that are over three years old, for which the initial inspection fee is RM75. There’s an additional RM25 for a re-inspection should the driver fail the initial inspection. 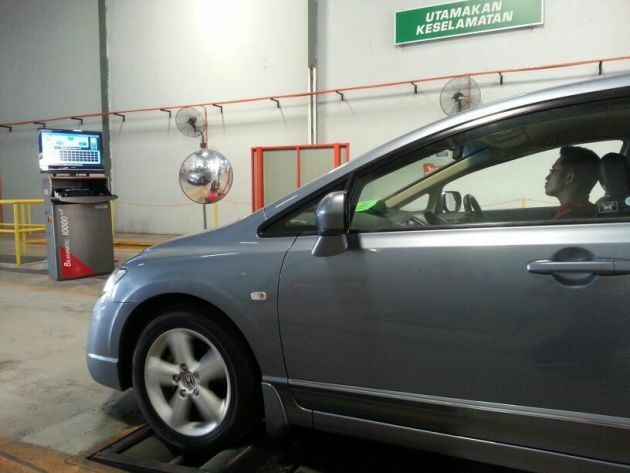 Subsequent inspections annually to ensure the vehicle is roadworthy every year is RM55. According to Puspakom CEO Mohammed Shukor Ismail, drivers do not need get their PSV licences first before sending their cars for a Puspakom inspection. He urged ride-hailing drivers not to wait until the last minute before sending their vehicles for the inspection. “This is to avoid any problems such as not getting approved within the stipulated time, or congestion at the last minute,” he said, adding that the company has extended its operations hours to seven days a week at 19 selected branches to ensure ride-hailing vehicle drivers will be served. Registration for the licence, which involves sitting for a six-hour training course at a cost of RM200, began on April 1 at authorised e-Hailing Operator (eHO) driving institutes and training centres. Drivers also need to pass criminal background and medical checks, contribute to Socso, purchase add-on car insurance and equip their cars with safety equipment, including fire extinguishers. Vehicles less than three years old will need to be converted from an individual private vehicle to an ride-hailing private vehicle. It was previously reported that a driver will need to spend around RM800 to complete the requirements, and with the licence application process being cumbersome and expensive, many ride-hailing companies are expecting that between 20% and 50% of their drivers will quit. I’m seeing a huge decrease of e-Hailing drivers for sure. That means slower acceptance rates for the already low supply of drivers to cater the high demand of passengers. This also means, lower ride quality due to all these costly registrations for part time and full time e-Hailing drivers who just wanting to earn for a living with the big companies like Grab or MyCar to continue charging high prices for their passengers and taking a huge profit from the drivers. Nvm. Count blessings we still hav Taxi drivers. That sounds like we should count our blessings we still have a Hell to drop into when some can’t go to Heaven. Is that something good? Everything is working just fine as of now…what is all this licensing for? If just want to get a piece of the pie, make a more transparent and simple process for it. No need license lar this lar pls. Unemployment rate is already high (government capability part of the equation? ),so why still want to corner the rakyat like this to no where!!! 50% rakyat, mainly from the poor, didnt vote for them so now they want to punish that 50%, which likely count on Grab for employment? Real sick & tired of them. They are also providing a level playing field for the 50% rakyat, mainly from the poor, who did not vote for them. They are also providing a level playing field for the 50% rakyat, mainly from the poor, who are taxi drivers, who did or did not vote for them. They are also apparently rich enough to hire trolls with names like RT & Chock posting nearly exact same comments at exactly same time when the only human possible way this can happen is copy pasting with a fake names. The question is, why? PH using gov money to sponsor their troopers now. Lame attempt to plotek themselves and divert the problem. But the pipu knows the truth and r punishing them 1 PRK at a time. GRAB & UBER was originally conceived to work outside the boundaries of traditional laws. Only recently did most gahmens worldwide (including Malaysia) had changed their rules to make it legal. So if Malaysian PH Gahmen decide to impose more restrictions to GRAB, GRAB can simply revert back to working outside the boundaries of this new laws. There is no loss to them since there are still overwhelming demand. PH Gahmen should realise restricting and limiting GRAB doesn’t give extra businesses to their taxi cronies. This follies of theirs are just inconveniencing the Rakyat. I spent 75 for the inspection and failed due no fire extinguisher, initially booked online appointment and paid 30. But my online application was rejected at puspakom because I choose wrong categories, it must be commercial not personal. I tried for a refund of the 30 and it was rejected. So total spent around 100 and an annual leave but sadly failed the test. Is it really worth it? This law obviously to protect taxi driver. Why why why? Look around those taxi drivers, most of them still lepak at one corner and waiting for passenger to look for them. So passive yet wanna complaint e-hailing so much. One taxi driver told me last time before e-hailing introduced, they can easily make RM5K per month with very little effort, if work hard a bit can get RM8K to RM10K and above no problem at all. Taxi company can also launch new app to compete with e-hailing, you can’t change them, join them. Of course your fare need to be reasonable. Last thing, some taxi driver dont even maintain their car, old car doesnt matter, at least properly taken care right? I took a ride from the same point A to B, different day but same timing, a 15 years old Saga (Taxi) with poorly maintained for RM15 fare vs a 10 years old Myvi (Grab) with pretty well maintained for RM8. Are you reading what you’re saying…? Laws to protect taxi drivers..? Reallly…? C’mon bro. All the taxi drivers wanted from the beginning was a level playing field. Taxi drivers had to have PSV license, insurance, cars inspected by Puspakom and such… and most do not own the cars but have to rent them from taxi companies. Uber and Grab came in and provided almost the same services but without all the hassle and cost of getting PSV license, insurance and inspection fees. Of course they can keep their costs down low without any of the stuff the taxi drivers go thru. It was up to the PH Govt to come up with a solution… take the middle ground and give everyone a fair chance. Instead PH Govt imposed everything the Taxi drivers got to the Grab drivers. If the solution was that easy the previous BN govt would have done it already. If taxi drivers did not have to take all the licenses, insurance and inspection like their counterparts at Grab… i bet they everybody would be smiling too. But the laws are there for the consumers… for the safety of the people using these services. Taxi drivers are more than happy to be rid of the regulations as well. with this so called level playing field, now grab driver can pick up passenger from the road side? Agree. The details were only released beginning 1st April 2019 and even so, they were not complete. Information are still trickling in which confuses a lot of drivers. Oh and Paultan.org, the initial inspection cost is RM75. RM55 is for the subsequent yearly inspections. You’re right, it is RM75, and RM25 more if the car fails to pass the initial inspection, and RM55 for each subsequent yearly inspection. Story has been edited. Thanks for the spot. many e-hailing drivers will drive illegally unless grab takes the action to ban all drivers that don’t have any license. And do u think jpj or mot would not force grab to do that? The drivers don’t earn much from Grab or other e-hailing company, and then government implement this kind of rules because of taxi drivers provoke and you think they have enough money to pay all of this. This rule is accepted if Grab make the drivers to be a rich guy. the winner is Puspakom(a subsi of DRB-Hicom)!!! monopoly business….